Our primary mission is to provide an opportunity for responsible use of firearms in a target shooting environment. The Carmi Rifle Club offers both indoor and outdoor facilities. Indoor is a .22 caliber rifle and pistol range as well as a heated and air conditioned meeting room. The indoor range is open for club events only. The outdoor range features a 25 yard pistol range as well as a 100 yard rifle range and shotgun area. Both of these have a roofed outdoor shelter for comfort and convenience. (See Photos). For member convenience the club provides picnic tables and shooting benches. A porta-potty is also on site. The club also offers NRA sponsored events such as Women on Target, NRA Day Youth Shooting Camp, and pistol classes. (See Events). The club has regularly scheduled pistol league events. All events conducted on the Carmi Rifle Club properties are in keeping with the safe and responsible, fun filled, action packed adventure and sport. Our primary mission is to a safe safe and responsible, fun filled, action packed adventure and sport. 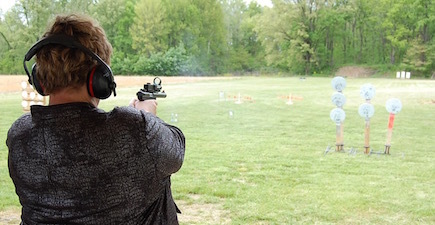 The club also offers NRA sponsored events with qualified instructors.